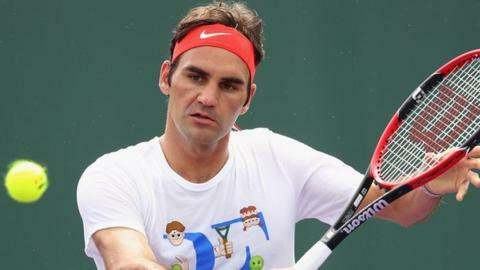 Roger Federer has pulled out of his comeback match against Juan Martin Del Potro at the Miami Open with a stomach bug. The 34-year-old was due to make his return on Friday after suffering a knee injury in January while running a bath for his twin daughters. The 17-time Grand Slam champion from Switzerland needed arthroscopic surgery to repair a torn meniscus. His place in the draw is taken by lucky loser Horacio Zeballos of Argentina. Federer's last match was his Australian Open semi-final defeat to world number one Novak Djokovic. The Swiss revealed on Thursday that he had spent 12 days on crutches following his first experience of surgery, and had only begun full training "probably a week ago, nine days ago". "If I feel something, I won't play. It's very simple," he said, but 24 hours later it was a virus rather than the knee that forced him to withdraw. His original comeback plan had focused on the clay-court season in Europe next month, and that now appears to be the likely schedule.